Found indigenously only in the North Cape Province in the Kalahari sand and grasslands (just touching the south western North West Province as well). It should be obvious that the Red hartebeest doesn't depend as much on water as other antelopes, for life in the Kalahari plains and dunes are harsh and extreme. They do have a feel for water, though. Not only do they dig out watery roots and vegetation, they also wander in the open (mostly dry) floodplains and vleilands in search for moist, and when they sense that rain have come down somewhere, even far away, they will migrate in their hundreds. When they found water (or when the rain comes down), they will be joyfully energized by it. Like the tsessebe, they are exceptional sprinters and should be caught really of guard not to outrun the most other animals. 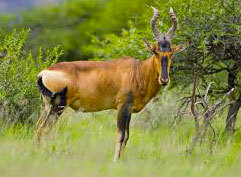 The only time the red hartebeest needs shelter, is when it search a hiding place for its newborns. The calves does have the same colour as the Kalahari sand, but this natural camouflage isn't always enough to keep all the carnivores at bay. Although the females also have a pair of the double twisted horns, the males's horns are heavier. This big long-faced animal is extremely inquisitive and will, even at its own cost, first stare at a newcomer though it might be danger lurking before bewilderment takes over. Then, for a moment,the herd will circle nervously before they decide on a direction of escape escape. Once on their way, their awesome speed is combined with a side-stepping and bouncing action which indeed makes for difficult catching up.